With July being the middle of the summer, many people are turning to State Fairs for a fun time. 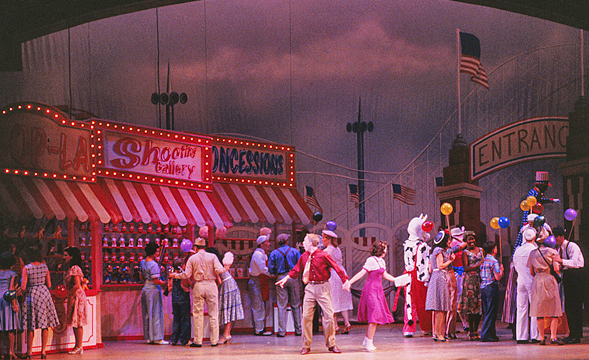 It only makes sense then that this month's Legitimate Theater looks at one of the most memorable outings in musical history: State Fair, by the iconic duo Rodgers & Hammerstein, and featuring the Oscar-winning song "It Might as Well be Spring." It epitomizes the carefree attitude of summer, and makes the idea of playing games and looking at pigs sound like a whole lot of fun. But the question is if the rare Rodgers & Hammerstein musical that went from film to stage (which is usually the other way around) deserves to be remembered in the ways that Showboat, Oklahoma!, or The Sound of Music is. It's time to step right up and find out for yourself. 1. "Opening (Our State Fair)"
2. "Driving at Night/Our State Fair"
4. "It Might as Well Be Spring"
6. "More Than Just a Friend"
7. "Isn't It Kinda Fun?" 8. "Reprise: It Might as Well Be Spring"
9. "When I Go Walking With My Baby"
10. "It's a Grand Night for Singing"
11. "The Man I Used to Be"
12. "All I Owe Ioway"
13. "That's The Way It Happens"
14. "Boys and Girls Like You and Me"
15. "The Next Time It Happens"
16. "Finale Ultimo - State Fair"
It does seem appropriate that a musical about State Fairs would open with a song that not only espouses on the principles of it, but claims that they have the best State Fair. Much like the other works of Rodgers & Hammerstein, the simple life of these characters are blended with a catchy and earnest melody that creates charming ensemble numbers. It's almost welcoming how it mixes in exposition and character introductions in a way that embodies what the show is bound to be: simple fun. This isn't meant to be complicated or overtly dramatic. It's just about going to the State Fair and having a grand old time. In that case, it is almost perfect from the first note. "Opening (Our State Fair)", "It Might as Well Be Spring"
While Rodgers & Hammerstein are predominantly known for their work on stage, this is one of the rare examples where they worked from film to stage, and it's easy to see why. While these songs all work within the context of the movie, they are more fitting on a stage where people can sing and dance in ways that are a spectacle. These are all solid numbers from a duo known for making music that at times takes cornball to new heights. In fact, the original songs are arguably the biggest standouts of the entire set list, in part because they feel the most organic to the duo's style. Even then, they get a nice makeover here with some powerful, catchy production and harmonies. As a whole, the soundtrack reflects the reality that these songs are more about moments than forwarding any plot. This is the best example of it all, with a romantic little ditty full of Iowan lingo where two characters in love go about their day. While this is solely a critique of the soundtrack, minus stage accompaniment, it is easy to guess that the few musical breakdowns here have some solid dance numbers attached, and it's here that the production warrants itself best. It manages to feel fun and make the idea of going to a State Fair sound like a memorable way to spend the day. It may be corny, but the earnestness really carries the notes in a way that elevate it. "It's a Grand Night for Singing"
Remember how Rodgers & Hammerstein are corny sometimes? Well, this song is a perfect example of how they sometimes don't know when to quit. It's supposed to be big and elaborate, but it's also among the most redundant and boring moments in the entire soundtrack. The initial melodies are sweet and cute, but there's a point as the instruments build and the vocals turn into rich harmonies that it suddenly becomes tedious. It's true that it reflects what a grand night for singing should sound like, but doesn't do enough with it to actually make for a great moment. One can hope that the stage directions make it at least fun to watch. From the gist of it, the story is predominantly the same. It's about a group of people who go to to the State Fair and have their own individual quarrels. The music cuts between the many singers in a manner that makes this immediately clear. There's nothing terribly noteworthy to mention as being added to the story, though there's several more songs and the entire show is given a fun and upbeat orchestra. The music is also more bombastic and fun, though maybe at the sacrifice of the intricacies of Rodgers & Hammerstein's work on film (though that's always the case with any adaptation). It has a lot of energy and fun songs, which is enough for a show like this. It's tough to argue whether this was necessary, as the film is easily among Rodgers & Hammerstein's minor work, way below something like Show Boat or Oklahoma!. State Fair has some fun songs, but it's not the most inspired story. With all of this said, it warrants as an adaptation of the film because it's where the duo have always belonged. They deserve to be on stage where the performance can come to life and interact with the audience. If nothing else, this production feels like it was given a reverent treatment of the material and allowed to expand in meaningful ways. It's not a great show, but at least it makes a strong case for being a good time.